The Ural region stretches from the edge of the Arctic Ocean to the north, to the very borders of Kazakhstan to the south. When discussing routes through the Urals, it is worth distinguishing between the Southern Urals and the Northern Urals - the Sub-Polar region. The southern part sees tours on foot, on horseback and by bicycle. As a result of the harsher climatic conditions in the northern Urals tours become more extreme and require excellent physical fitness. 1. 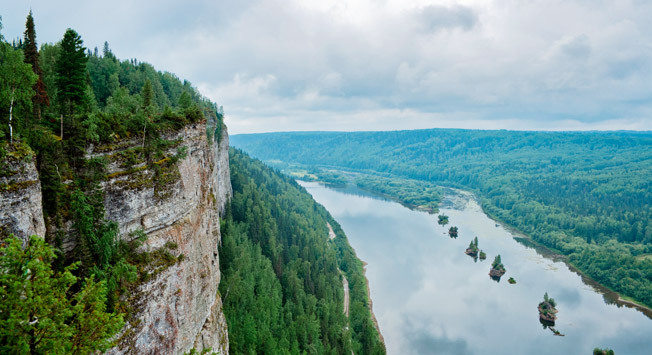 For anyone who likes an active holiday there are excellent opportunities for rafting or floating down the mountain-rivers in a catamaran in the Urals. Rafting accompanied by instructors is suitable for any skill level, even for beginners. The best time to go is between July and September, The attractive weirs, mountain lakes and magnificent mountains cannot fail to touch any traveller. 2. Equine tours are one of the most popular types of active tour in the Southern Urals. You can even reach those places that are impossible to reach by foot on a horse. The horses are a specially selected Bashkir breed, the result of a cross between Steppe horses and forest horses that lived to the north of the Bashkir region. These creatures are surprisingly sturdy, and are known for their intellect and placid nature. An equine tour around the caves and mountains of the Urals starts from the city of Beloretsk. Fishing, swimming, mushroom and berry picking can all be enjoyed along a route that is more than 100 km in length. Touch the ancient ‘Kapova Peshchera’ cave in the ‘Shulgan-tash’ reserve famous around the world for the carvings made by primitive man in the Palaeolithic Age! 3. The Summer is the best time for a road trip from Yekaterinburg along an original route. Hire a car or that legend of the Soviet motor industry the ‘Ural’ motorbike that shares its name with the region, and which was produced in a factory in the Sverdlovsk district. 4. There are mineral deposits in the Sverdlovsk region in the central Urals - gold, silver and platinum are all mined here. The stratum of precious stones found in the Urals is famous around the world for topaz, emerald, amethyst and ruby, as of course are the region’s master jewellers. So-called ‘ mineral tours ’ are rapidly becoming more popular. Naturally, who would not want to boast about finding their own precious stone? The ‘Izumrudnye Kopi Urala’ (Emerald mines of the Urals) one-day tour includes a visit to the modern Emerald mines, a chance to meet master jewellers, a presentation on rough emeralds found within the rock itself and a master class on cutting precious stones from the Ural region. 5. A nature reserve was created in honour of the author Bazhov - the ‘ Bazhovskye mesta ’ in the Sverdlovsk region. The park is made up of 99% pines and birch trees, so it is very easy to breathe. In the reserve you can see for yourself the Taiga’s medicinal plants growing wild or even stumble across a fox or a mountain hare on your travels. The park is open for anyone to visit. You can start to explore the park along one of 6 pre-determined routes that differ in complexity and length. 1. A range of tours and routes are available for those who enjoy an active holiday: mountain skiing, horse drawn sleigh riding, snowmobile trails, riding dog and reindeer drawn sleighs as well as combined tours. Equine tours explore offshoots of the Kraka-Tau ridge towards the Kaga and Adigey rivers. You would need to cover around 50 km in the course of two days. Snowmobile trails are offered in the Southern Urals and last for around 5 days. The programme includes training, and then a run on the snowmobiles out to the edge of the Bashkiria state reserve, with an exploration of the ridges of the Central and Southern Krak, along the edge of the Shungan-Tau reserve, Bashkiria’s national park, and a ride on jet skis on the Nugushkoe Vodokhranilishche (Nugush Reservoir). Tourists stay in wooden huts where they are served hot food and refreshments. Ski tours start off in the city of Beloretsk, and pass through historic sites and along the picturesque ridges of the central Krak, and the edges of the Bashkiria national reserve. Accommodation on the way is in forest huts with supper served on a stove, in a Bashkirian Yurt with an open fire, and in a wooden house with training on how to light the stove and make pelmeni. Do not forget how harsh Ural winters can be: during the day the temperature remains at around -15 degrees, but at night It can go down to -25 degrees. 2. Of all the most popular sites in the Urals it is worth taking in a geological monument - the Kungurskaya Ledyanaya peshchera ( Kungur Ice Cave ) located 100 km from the city of Perm. The majority of lakes and caverns form part of the Kungurskaya complex, which attracts more than 100,000 tourists a year. This is hardly surprising when you consider the ‘attractions’ that are on offer to visitors. For example you can spend the night in the cave or look for ancient treasure for a few days as a package. The cost of a sightseeing tour is around 500 roubles (that would be 8.25 GBP or 13.71 USD) while organising a romantic date in the cave is 15,000 roubles (that would be 247.50 GBP or 411.15 USD). 3. A challenging attraction for real men is winter fishing in the Northern and Sub-Polar regions. Fishing is an expensive hobby: lines are cast using helicopters that fly from the Perm or Sverdlovsk regions. Routes can be drawn up on a bespoke basis and you will naturally be consulted on your choice of tackle, bait and how you would like to fish. One of the most famous fish in this region is the grayling – a predatory fish belonging to the Salmon family with beautiful colouring, which lives in the cold, pure mountain rivers. A grayling can reach 5 kg in weight. 4. The enigmatic ‘pereval Dytalova’ (Daytlov’s pass) awaits those who thrive on pure adrenaline . Dyatlov’s group of nine tourists perished on 1 February 1959 and today this remains one the most puzzling stories in the history of the Urals. There have been so many versions over the years: a landslide, an attack by wild animals, a man-made disaster, a secret weapon and so on, not one explanation however has a logical rationale. After joining a group of experienced tourists you will cross the pass in the course of a week. The costs of this tour is around 30,000 roubles (that would be 495.00 GBP or 822.30 USD) . Do not worry, satellite communications, a portable radio and a team from the Ministry of Emergency Situations will keep you safe on the pass. 5. Finally if you visit Yekaterinburg, you will not be able to forgive yourself if you do not ‘step across’ the historic border between Europe and Asia . This border between these parts of the world is symbolized by two stones: one of them was brought in from the furthest point in Europe – Portugal’s Cape Roca and the other from the furthest point in Asia - Russia’s Cape Dezhnyov.